The term single origin means coffee that has been sourced from a farm, cooperative, coffee variety, or region. This differs from a blend which is a coffee made up of several single origin coffees. In short, we enjoy single origins because they showcase the flavors of a particular place. What creates the unique flavors of single origin coffees? To borrow a term from the wine industry, it’s terroir—climate, soil, elevation—all contribute to the distinct flavor of your favorite coffee origin. Soil: Was the coffee grown in volcanic soil? It can impart a smoky taste in the coffee’s finish. Elevation: the higher the elevation the more likely you will find elegant flavors like citrus or floral notes. Process: Washed coffees typically have a “cleaner” finish. Dry process coffee will have earthier and berry notes. Honey process, depending on how much fruit has been removed, can have a smooth finish (“white honey”) or may be full-bodied and complex (“black honey”). Finally, single origins represent a harvest. That is why during certain times of the year we may be waiting for the new coffee harvest to arrive at our roastery. 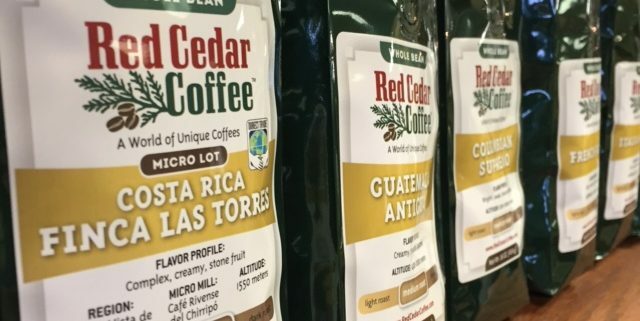 In the Red Cedar Coffee Co. Tasting Room our single origin coffees are represented by either a gold or green band across the front label. Examples of our single origin coffees include Organic Guatemala Huehuetenango, Costa Rica La Lia Finca Dragon and Ethiopian Sidamo. Our coffee tastings also provide an opportunity to learn more about single origin coffees and to taste why they are unique. March 27, 2018 /by Anne D.